Well, if you haven’t seen it yet, here is the rest of that presentation. Some more interesting stuff in here and I hope you enjoy it. 1. Why does the priest substitute Adonai for the divine name? I thought that Karaites do not do this! 2. Role of women in the synagogue: Do women pray behind the men or beside them? Is the women’s prayer space equal to the men’s in size and ability to see and hear the woeship leader? Thank you Eleanor, I am glad you enjoyed the presentation. As to your questions. I am not sure you what you heard about Karaites and the Divine Name, but the overwhelming majority (maybe 99.99%) of Karaite Jews in the world say Adonai instead of the personal name. 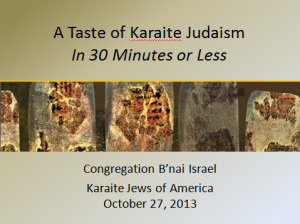 There is no BAN on pronouncing the name in the Karaite community, but as a factual matter Rabbinic Judaism (and its ban) has influenced the Karaite practice. 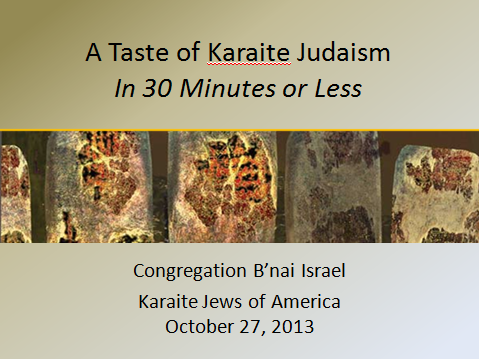 Of the historical Karaites in the U.S., some say God’s name when discussing Tanakh, but do not use it otherwise. As to the role of women. In the Daly City synagogue, women pray to the left of where men pray. The size is a bit smaller (maybe 75%) and they can all see and hear the Hazan (i.e., cantor = person leading the services).